Fire-King, a brand of glass made by Anchor Hocking from 1940 through 1976 is readily associated with many different colors of dinnerware and kitchenware including Jade-ite and Sapphire Blue. There are actually a number of other colors and patterns to know when it comes to collectible Fire-King glass. This floral Fire-King glassware pattern was produced from 1945 to 1949 in two very different colors. The blue and white version (as shown here) was named Vitrock. The Alice pattern was also made of Fire-King's popular Jade-ite glass. Of the two, you will find the Jade-ite pieces more often than Vitrock. The Jade-ite pieces were given away as premiums with cups and saucers going to buyers of Quaker Oats and plates awarded to those visiting movie theaters. Not all Alice pieces are marked. Anchor Hocking made its Charm pattern from 1950 to 1954. All the pieces, even the cups, are square in shape and were marketed as being heat resistant. Colors included Forest Green, Royal Ruby, Azur-ite (as shown here), Ivory, Jade-ite, Milk White and Pink. The most popular colors with collectors are Forest Green, Ruby Red, and Jade-ite . When it comes to the most expensive pieces in the Charm pattern, plates in Jade-ite can get quite pricey selling for $30 to $40 each. Most pieces in the Forest Green color, like small bowls, cream and sugar pairs and cup, and saucer sets, sell in the $5 to $15 range. This simple decaled pattern on plain milk white glass was made as part of the Fire-King line from 1958 to 1960. It was also marketed as being heat resistant. One of the best parts of being a fan of Fleurette is the low cost in comparison to some of the other Fire-King patterns. Entire sets can often be found for reasonable prices. Buying piece by piece you'll get most for less than $5 each. The matching snack sets, which consist of a rectangular plate with an indention for a cup, usually sell for $10 to $15 per set. Like Fleurette, albeit a bit more colorful, the Honeysuckle pattern is decaled onto milk white glass. Anchor Hocking produced this pattern from 1959 to 1960. Most pieces in Honeysuckle are also reasonably priced. Even the platters, covered sugar bowl and snack sets fit most budgets. The Glass Lovers Glass Database also notes, "There are two different glass tumblers that go with this set. A 5 oz. juice glass and a 12 oz. iced tea glass. Both have the honeysuckle decoration on them." These are a bit harder to locate, and among the higher priced pieces in this set. 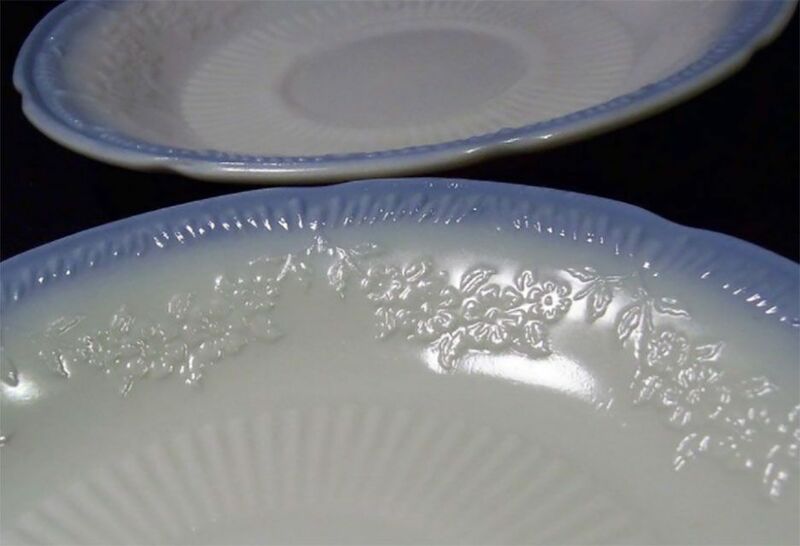 Jane Ray is one of Anchor Hocking's longest running dinnerware lines. It was made from 1945 through 1963. Jade-ite (as shown here) was by far the most popular Jane Ray color with original consumers given the number of pieces that are available to collectors today. About 20 years ago, this pattern was even more plentiful. Antique malls held stacks and stacks of it for reasonable prices. Martha Stewart featured it on her television show and in her magazine. Then all that changed; for quite some time prices were high, and Jane Ray was harder to come by. Prices have moderated for the most part now, with many pieces selling in the $5 to $15 range. Bowls are harder to come by and can cost considerably more, however. This dinnerware line was also marketed as being heatproof, and like other Fire-King patterns, the pieces are marked on the back. Other colors include Ivory, Peach Lustre, Crystal, Amber, White, and White trimmed in gold. This pattern was made from 1968 through 1976, as noted on the Replacements, Ltd. (a china matching service) website. It is a decaled pattern, like Fleurette and Honeysuckle shown above, on milk white glass. The Meadow Green pattern is found on dinnerware items like plates, handled soup bowls and mugs, but matching mixing bowls and ovenware were also produced. Most all pieces can be readily found at thrift shops and estate sales today, and the prices remain reasonable. Even when sold by glassware dealers, dinnerware items can be found for $3 to $10, while ovenware pieces usually bring $10 to $15. Mixing bowls might run a bit more, in the $25 to $35 range for a set. This pattern was made by Anchor Hocking from 1960 until 1962. 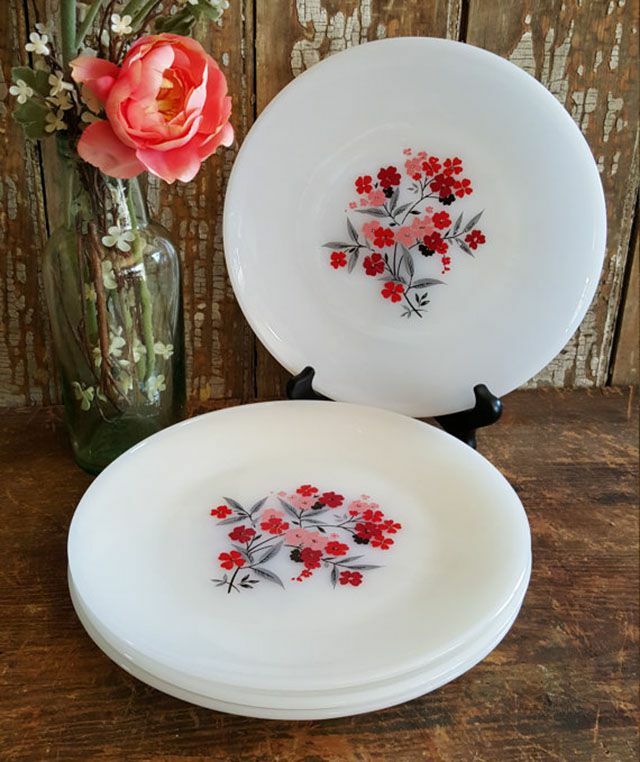 It features a decaled floral design on milk white glass. Like Meadow Green shown above, which was introduced later in the 1960s, this pattern included both dinnerware and ovenware pieces. The dinnerware line included tumblers and snack sets among the other more common items like plates and cup and saucer sets.